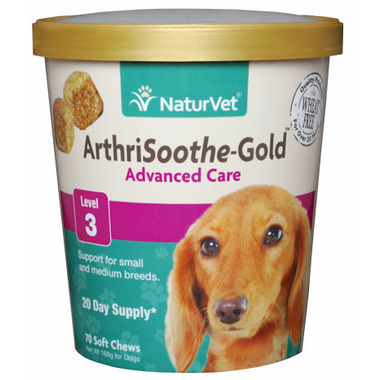 Naturvet ArthriSoothe-Gold Soft Chews are designed for dogs that are in need of advanced joint care! These soft chews are great for senior dogs and those recovering from joint related surgerys. Show some love to your best friend by helping to maintain healthy bones, connective tissue, joint structure and function. Active Ingredients (Per 3 Soft Chew): Glucosamine (Shellfish Source) (500 mg), Methylsulfonylmethane (MSM) (500 mg), Chondroitin Sulfate (Porcine Source) (200 mg), Green Lipped Mussel (Perna Canaliculus) (200 mg), Enzymes Blend (130 mg), Boswellia Serrata (90 mg), Yucca Schidigera (90 mg), Calcium Ascorbate (Vitamin C) (60 mg), Zinc (7 mg), Hyaluronic Acid (5 mg), and dl-Alpha Tocopheryl (Vitamin E) (60 IU). I have been looking for something to help my 17 year old dog and am very glad that we found this product which seems to help her arthritis. I have 2 sweet, aging dogs with various aches and pains. So far, this product has kept them active and going on their long walks everyday.